57 experts – many of whom are NATS members – have all contributed to an amazing collection of quick-to-read, yet deeply insightful strategies. Royalties from book sales will be donated to National Association of Teachers of Singing. 57 experts from across the country working as professors, studio teachers, professional singers, choral directors, composers, vocologists, and speech-language pathologists have all contributed to this amazing collection of quick-to-read, yet deeply insightful strategies. It’s like finding expert trade secrets all placed in one easy source. 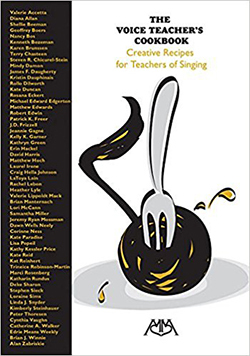 With outstanding records of performance, workshop clinics, recordings, research, composition, leadership, and teaching, the authors provide their favorite “recipes” that will expand your current knowledge and inspire all levels of voice teachers and singers. Everything is a Mix: It Depends on your Recipe! Delray Beach, Florida (April, 2018) The Voice Teacher’s Cookbook: Creative Recipes for Teachers of Singing, compiled and edited by Brian Winnie.